day in Penang hill. What is the attraction at Penang hill whereby worth to pay it a visit? Since this is the first time you are coming over to Penang island, I do the same recommendation too. Funicular train. 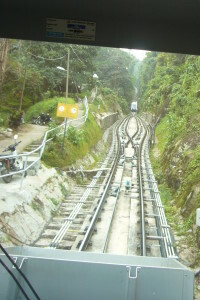 The funicular train itself is one of the Penang hill attraction. The 15min ride in the train will give you a marvelous experience. Try to squeeze yourselve in the first cart, so you can see more scene. Forget about the seat, but you want the scene. You will love it. Hiking. There are several trails for you to choose to reach the peak, one of the Penang hill hiking trail is from Penang Botanical garden via Gate 47, 84 then to the peak. You can find out more about this trekking trail in my other post. By jeep. Unfortunately not all the public jeep is allow to take the road up to the hill, probably you want to drop this choice. Penang island scenery is under your eye-side. You will feel a little hot and strong sun light if you come around noon time, but it definitely a good moment if you could stay till evening. The night scenery is beautiful. Again, you cannot compare the night scenery of Penang hill with Hong Kong, that is just gorgeous. Once you reach the Penang hill, you will come across a David Brown Restaurant up at a small hill. This is a good place for you to take a rest and have a cup of coffee. If you could stay till evening, enjoy the dinner at outdoor, a remarkable one. There are many bungalow at the Penang hill, those are occupy by the rich or the well-known VIP. But who cares the owner of those bungalow, you just walk along the road and having a relax trip. This is what I normally did. What else at Penang Hill? If you want more from Penang Hill, there is a hotel in Penang hill. This is not a grand hotel like Shangri-la Spa Resort at Batu Ferringgi, but it just a small hotel. You can enjoy the tranquient moment staying there. Be ready, it maybe a little boring. There is an Indian temple and some gardens at Penang hill, it is not the must see attractions on the hill but no harm if you have extra hour or so. Maybe you will say there are not much attrations on Penang hill and want to drop this, but I strongly recommend not to do so. Penang hill still is one of the must visit or must see place. Again, enjoy the scene and Penang hill attraction.